Last week we wrote (Phase 1 article) about some decisions that had to be made in the married put position analysis of LITE. Since then position management steps were taken to improve its profitability. Write a $50 strike out of the money (OTM) covered call, which would guarantee 15%+ if the stock remained constant at $47.90 or went higher. The investor chose step number three in the belief that the 3-D sensing technology developed by LITE would provide future growth. Therefore, rather than cash in now or just hold, he opted to earn some more income while waiting for continued stock price advance. After several days way up on LITE stock, there are more position management decisions to make. Over the weekend, Barron’s printed an article (by Tiernan Ray p.24) that discussed LITE and their 3-D sensing technology. 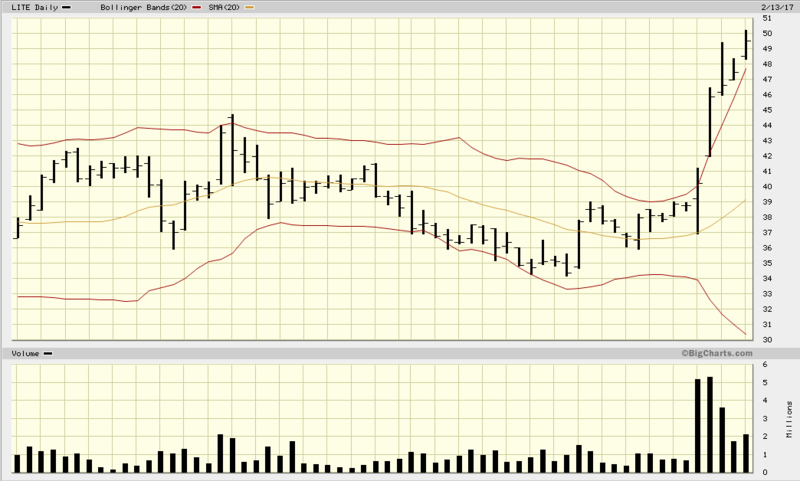 The following trading day LITE advanced again to a high of $50.20. And then advanced the next day to over $51. Maybe this price movement should have been expected when the stock price jumped over the Bollinger Band on high volume. An indication that something is different and very positive. The Put had only 30 days left before expiration and we would lose our insurance. But rolling the put out in time and up in strike price could lock in additional profits, more bullet proof, and buy more time. Yes, it costs more to roll up the put. These actions have locked in more profit and provided time to see if this run up in stock price has the legs to go further. As the stock price changes the Power Options position analysis will continue to look for profit enhancing opportunities.